Leadership Weatherford is a program of the Weatherford Chamber of Commerce that offers an educational experience designed to help identify and motivate potential community leaders, provide educational experience that focuses on community issues & needs and challenges participants to apply their talents throughout their community. 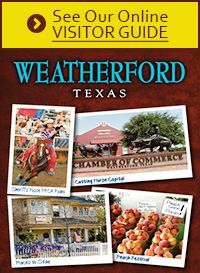 Leadership Weatherford is a nine-month education and development series packed with the very best course curriculum. 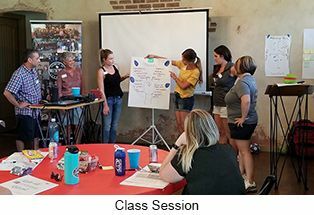 The series features local and outside leaders/speakers, hands-on tours and field trips to community facilities, services and venues. The basis of the series is observation and interactive participation on a once a month basis. 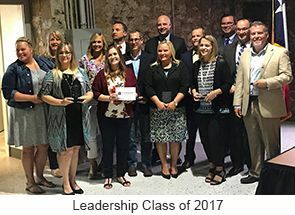 The series is structured so that participants of Weatherford Leadership can access information and learn to be better leaders in a format that encourages lifelong business relationships. 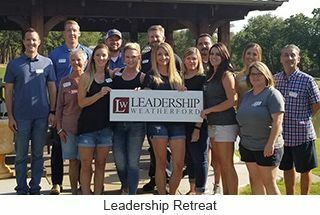 Leadership Weatherford is held the third Friday of every month from September to May beginning with an over-night retreat and a 4-6-hour class beginning at 8:00AM and a class trip to Austin for Parker County Days. You may only miss four hours total during the class. Any tardy or partial days will be included in this four-hour total. Orientation retreat is mandatory. Cell phones must be silenced during session times. Breaks will be allotted for checking messages. Prior to Education Day, you are required to attend a Weatherford ISD school board meeting. 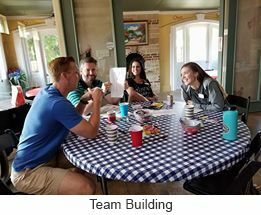 After graduation, you will volunteer to serve on a committee or board (Chamber, City or non-profit). Next class will begin the Fall of 2020. For information, contact the chamber office at 817-596-3801 or .